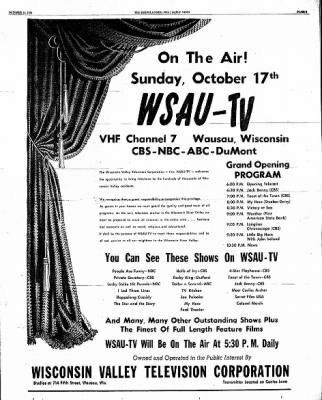 The birth of television in North Central Wisconsin started when WSAU-TV Channel 7 began broadcasting on 10/23/1954. One of the founders was William F. Huffman, owner of the Wisconsin Rapids Daily Tribune and radio station WFHR. Also involved were the Antigo Journal, Marshfield News, Merrill Daily Herald, Rhinelander News, Wausau Daily Record-Herald and radio station WATK in Antigo. WSAU-TV would be the first station in Central Wisconsin close enough to be viewed clearly here by means of a rooftop antenna. Wisconsin Rapids native George Frechette was named station manager, vice president and general manager. He had been general manager of radio station WFHR and business manager of the Daily Tribune, which he had joined in 1928 as a reporter. Other staff included assistant general manager Richard D. Dudley, from WSAU radio; chief engineer Roland Richardt, a WSAU radio pioneer, station program manager James K. Harelson, and art director Sid Kyler. WSAU-TV originally operated from the Plumer Mansion, a Richardsonian Romanesque-style building that was located on N. 5th St in Wausau and torn down in 1972, one year after the station moved to its current home. The Plumer Mansion's castle-like exterior and a suit of armor displayed in the mansion inspired the station's graphic designer, Sid Kyler, to design a medieval-style "7" logo along with an accompanying cartoon mascot, the fully-armored knight "Sir Seven." The logo and mascot served as representations of the station for several decades. WSAU-TV was an affiliate of all four networks in the beginning (CBS, ABC, DuMont, and NBC). The Dumont Afiliation lasted until 1956. DuMont cancelled most network programs on April 1st, 1955 but honored network commitments until August 6th, 1956. By 1965, WAOW-TV signed on as the local ABC affiliate, and in 1966 WSAU-TV lost NBC when WAEO-TV (now WJFW-TV) signed on from Rhinelander.  That left channel 7 with CBS, its current affiliation. The stations call letters were changed to WSAW on 03/08/1981 after its owners sold the AM and FM sister stations. Originally published in the Abbotsford Tribune Thursday, October 14, 1954. WSAU-TV, operating on VHF channel 7 in Wausau, began test patterns on Tuesday, October 12, according to an announcement by George T. Frechette, Vice president and general manager of the Wisconsin Valley Television Corporation, owner of the station. The test pattern operation is on the air from 10 a.m. to 9 p.m. for the rest of the week, and barring unforeseen difficulties, WSAU-TV will commence program operations Sunday evening, October 17th. The Wisconsin Valley Television Corporation is owned by daily newspapers in Wausau, Marshfield, Merrill, Antigo, Rhinelander and Wisconsin Rapids, Radio Station WFHR, Wisconsin Rapids, and WATK, Antigo, and Charles Lemke of Wausau. The corporation also operated radio station WSAU.